Is there any chance of a vacant seat? There might be now – take the weight of your feet on the Connemara Bus. The women all wearing their bright woolly shawls on the Connemara Bus. The women discussing the latest style on the Connemara Bus. Their yellow beaks sticking out of the sack on the Connemara Bus. The chickens cheeping all the way. We talk about prices as we sway on the Connemara Bus. With laughing women all rosy of cheek on the Connemara Bus. It’s a grand soft day, so thanks be to God for the Connemara Bus. This song used to be sung by Dingoe on his radio show ‘Take the Floor’ in the 1960s. My father married Mary Halloran of Oughterard. Her uncle was a man called Ferguson. He had been in the Colonial Police in Shanghai. 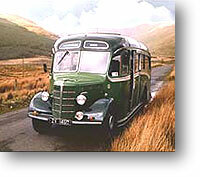 When he came home, he bought a bus and ran it; it was the Connemara Bus. Our last trip to Connemara was in July 2016 when we spent a glorious wet week based in Letterfrack. My wife and I then were 81 and we were joined by family and relatives numbering 10 at times. This was our last trip as the drive from Youghal is becoming to long for us. The following lines were inspired by my emotions on our last trip South. ne’er see again your crystal brooks or your wave sculpted shore. it bleeds my heart to know I’ll never see these sights again. then came the foreign nobles to usurp their liberty. a fisherman loads his lobster pots,I yearn to lend a hand. the sun sets o;er your thousand isles,another day must end.